This year has seen a surge of progressive Democratic women running for office, inspiring hope that, by January, Pennsylvania will no longer send an all-male congressional delegation to Washington. But one consequence of the trend is that women in congressional primaries are often faced with trying to defeat women they respect and agree with, forcing some tough choices among candidates and those who champion the cause of electing more women. “The fact that so many women are stepping up to run for office in this cycle, some of them in the same district, we see as a good problem to have,” said Julie McClain Downey, spokeswoman for the powerhouse group Emily’s List, whose mission is to promote the election of Democratic women who support abortion rights. But Emily’s List is confronting some dilemmas. Consider the case of the new 4th Congressional District in Montgomery County, redrawn by the Pennsylvania Supreme Court as the result of a gerrymandering lawsuit, and now a district likely to elect a Democrat in November. 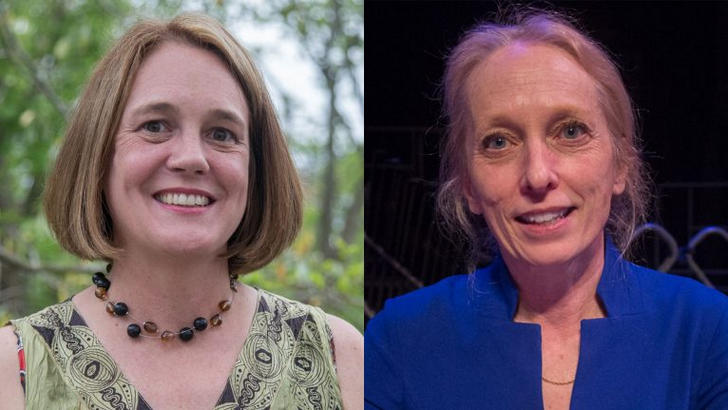 Three progressive women filed to run in the Democratic primary — state Reps. Mary Jo Daley and Madeleine Dean, as well as Shira Goodman, a leading gun-control activist. Former U.S. Rep. Joe Hoeffel made a last-minute decision to enter and raised little money, but his name recognition has made him a credible contender. As the race unfolded, Daley considered the uncomfortable prospect of three credible women splitting votes and sending Hoeffel back to Washington. In mid-April she took a hard look at her polling, which showed her second, and at the dynamics of the race. “And I thought, ‘You know, I really would like to see a woman. It looks like we are going to be splitting votes between us,’ ” she said in a recent interview. Daley endorsed Dean and took her around Narberth, encouraging her own supporters to back her. All three women had sought the support of Emily’s List, which requires candidates seeking its help to show their internal fundraising numbers; it wants to be sure candidates are viable before making a commitment. Goodman said she’d been providing the detailed information Emily’s List requested. Then, days after she made a strong showing in the April fundraising reports, the group suddenly endorsed her rival, Dean. Emily’s List’s didn’t just endorse Dean. The group’s super PAC has so far spent $237,000 on mailings for her. If feels, Goodman said, like they put a finger on the scale. Goodman said the April campaign finance reports showed she’d raised more than everyone in the field. That’s true only if you subtract from Dean’s fundraising totals the $250,000 of her own money she committed to her campaign. And Dean was an elected official in the district, arguably giving her an edge in name recognition. Goodman had another take on that. Emily’s List, which is supporting five women in Pennsylvania congressional races, didn’t have much to say about why it supported Dean. The new 5th District centered on Delaware County is also a Democratic-leaning district, and the Democratic primary has attracted a sprawling field of six women and four men. Candidate Mary Gay Scanlon, said in a recent interview there’s “an embarrassment of riches” in having so many smart, progressive women running. Scanlon has for years led the pro-bono work for the national law firm Ballard Spahr. She’s been endorsed by former Gov. Ed Rendell (who’s also with the firm), as well as several Democratic township committees and elected officials, including state Rep. Leanne Krueger-Braneky. The challenge in a primary battle like this, where candidates tend to agree on a progressive agenda, is to distinguish themselves from their rivals. The women in the race aren’t attacking each other, but they try to draw distinctions, each emphasizing her unique experience and ability. Scanlon says, unlike first-time candidates, she’s served in local government, chaired a school board — and that matters. Scanlon is one of two women in the race who’ve raised more than $500,000, enough money for robust campaigns and sizeable television ad buys (Scanlon has contributed $250,000 of her own funds). The other is former federal prosecutor Ashley Lunkenheimer. Lunkenheimer tells voters she’s put gun traffickers and con artists who swindle seniors in jail, but she says that not just a prosecutor. Speaking to a living room crowd in Bryn Mawr Sunday, she said she’d made a conscious decision to get a master’s in social work before going to law school. Lunkenheimer was introduced at the Sunday event by Lynn Yeakel, a 1992 U.S. Senate candidate and highly regarded figure among progressive women in the region. She was one of a list of women who endorsed Lunkenheimer last week, including two former candidates in the 5th District race. Also in the race is Molly Sheehan, a first-time candidate with an activist base, and state Rep. Margo Davidson, who notes she’s the only female elected official in the race. Davidson said at a recent debate that her priority is serving the most impoverished parts of the suburban district. Two other women and four men are also in the race, including veteran state Rep. Greg Vitali and former Philadelphia Deputy Mayor for Labor Rich Lazer, who’s benefited from more than $600,000 in independent spending by construction unions. Emily’s List has not endorsed a candidate in the 5th Congressional District. Given the size of the field, the winner could take the nomination with a small plurality of votes. Whatever the outcome in the 5th, it appears likely that women — probably more than one — will go to Congress from Pennsylvania and end the state delegation’s status as an all-boys club.